After seeing on Twitter that there was a special ticket promotion for last night's Padres game offering a buy-one-get-one-for-$1 deal, I immediately jumped on it and was downtown in my favorite section in Petco Park (Toyota Terrace close to home plate) within a couple hours. It was my first Padres game since an August Saturday afternoon loss to the Phillies when the first place Pads had just begun their long streak of losses. Last night they were coming off a successful (2 out of 3) weekend series against the Reds but had lost 1-0 the previous night, Monday, to the Chicago Cubs. Fiery, young, and talented staff ace Mat Latos was on the mound facing Ryan Dempster, one of the Cubs' consistently strong rotation cogs for years now. This season, while the Cubs have been terrible and put a pretty weak lineup to the plate, Dempster has continued to be reliable on the mound, ranking in the top 10 in his league in strikeouts, innings pitched, and fewest walks allowed. The first four innings of the game went very fast as both starters settled into a groove quickly. Dempster allowed only one hit through 4 even though Adrian Gonzalez and Chris Denorfia had both smoked line drives deep into the outfield that centerfielder Marlon Byrd snatched at a full sprint and Latos let up a hit and a couple walks. Then in the top half of the 5th, the 22-year-old Latos gave us another example of how he can pretty easily let his frustration and anger get the best of him while on the mound and have his composure and effectiveness rapidly snowball downward. 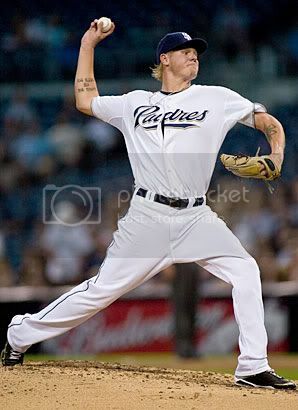 Latos without a doubt has the ability to be one of the top pitchers in the major leagues (he had the most dominant month in San Diego Padres history back in May with a .160 average allowed) but he is his own worst enemy. He gets pissed when he screws up and he knows it. In the top of the 5th, he allowed the Cubs two runs on an error of his own while trying to barehand a groundball, and then 3 consecutive hits including a hard liner off his leg. After Latos had been struck by the ball, it seemed for a moment like the manager and team trainer weren't even going to come out and check if he was okay (even though you always see them come out just as a precaution, especially with a young pitcher) and I thought maybe they were afraid to come out and talk to him because he just appeared so visibly enraged and explosive due to the inning's proceedings. He managed to make his way out of that 5th inning allowing only 2 runs but then quickly crumbled in the 6th right after his catcher had smacked a two-run homer to tie the game. A clean liner by Xavier Nady and then a bomb to centerfield by Alfonso Soriano knocked Latos out of the game with his team trailing 4-2. I was monitoring Dempster very closely during those three at-bats and he really seemed to reach back for something extra in his adrenaline bucket and threw his awesome slider viciously. According to FanGraphs, Dempster's slider alone has been worth a wopping 20.1 runs saved above average this season and he effectively used it to strike out the side and escape a Padre rally in his final inning of the night. That series of events totally deflated the entire stadium and I began deeply considering leaving the game early (something I absolutely never do) and officially giving up on this disappointing Padres playoff chase. When the long-limbed lanky (physically he is perfectly emblematic of the word "wiry") reliever Mike Adams allowed a home run to the long-limbed lanky (emblematically "wiry") Alfonso Soriano, I was done. I left at the end of the 8th after the Padres amounted absolutely no comeback. I've loved watching this team play all year. I've been to more of their games this season than I've ever been to see one team in my life and I even once seriously considered them as a World Series threat. But I think the dreamy 2010 Padres Cinderella Story has slowly disintegrated and turned to dust. They won tonight and they need 4 more wins in their last 4 games to clinch the playoffs but from what I saw of them Tuesday night, they don't look like they can mount that last grunt towards the finish line that they need. They look tired and worn out and stressed from the beating they've taken over the last 30 days or so (the team is now 11-15 for the month of September after winning over 58% of their games for the first 5 months). I give them credit for knocking the Rockies off the postseason hill and it's certainly not inconceivable that they beat the Giants head-to-head this weekend but I just don't see these guys suddenly bursting back to life. I'll eat my words if they prove me wrong but to me they look like they're finished. I'll still be watching and rooting for them, though, and interestingly enough I'll be up in San Francisco all weekend while they battle the Giants. The inevitable dream/fantasy/miracle scenario would feature me at the ballgame Sunday afternoon with a postseason berth on the line and a Padres victory but....we'll see. As it stands right now the Padres are 2 games behind the Giants in the NL West and 1.5 behind the Braves in the Wild Card. Just going by run-differential, a pretty simple gauge of team skill and overall performance, the Padres (+84) are now lagging well behind both the Giants (+112) and Braves (+121) after being atop the National League for much of the season. There's no doubt these Padres have overachieved for the whole year and no matter what happens these next few days, their current 88 wins is a great season for them (I pegged them for 85 wins before the season and even that was wishcasting*). It's a bit sad that it has to end with them slowing down to a crawl but it shouldn't take away from how posterity views their overall performance. *By the way, don't look back at those preseason projections...I picked the Giants to finish dead last.